When Milo's mom is abducted by aliens, Milo must journey to another planet to save her. Assisted by Gribble, a grown man who acts like a young boy; and Ki, a bubbly alien who refuses to conform to society's rules, Milo explores the red planet in search of his mother. He must discover why the aliens have targeted his mother and take her back home where she belongs. We begin with a look at some extraterrestrial life. The film opens on Mars, showing the birth of baby Martians. The babies are not "born," they instead sprout up from the ground. (I suppose that they grow under the ground like potatoes??) Next, we see the adult Martians looking at Earth on a large screen. They zoom into Earth looking at the humans. After watching several mothers with their children, they stop at a mother who is telling her son to take out the garbage, and the son obeys. The large screen targets the mother, and the Martians are excited for some reason that we do not know yet. Now, we go to the home of the mother the screen targeted. She is thanking her son, Milo, for doing what she asked him to do. Milo is upset that he had to take out the garbage. Then, Milo's father calls, saying that he won't be home from work in time to take Milo to the movies as he had planned. Milo's mom then tells Milo that if he eats all of his dinner, they can rent a different movie at home. Milo is ecstatic. Later, Milo's plate is almost clear except for his broccoli. His mother tells him that if he doesn't eat it, he can't watch his movie. Milo feeds his broccoli to the cat. The cat throws up behind a house plant, and Milo's mother is angry. Milo talks back to her, and she tells him to go bed without seeing his movie. Later, when he is caught jumping on his bed, Milo says that he would rather have no mother at all. Milo's mother is very upset by this. After she has gone to bed, Milo realizes that he shouldn't have said that to her. He goes to apologize, and sees a large spaceship leaving his mother's window. His mother is nowhere to be seen. He manages to catch up to the spaceship and gets inside of it. The spaceship goes to Mars. Now, we see the Martians again. They are overjoyed to have Milo's mom in their custody, but we still do not know why. Milo is put into a prison cell. He escapes, but then he is pursued by the Martians. A voice tells him to go down a chute, and he does. He lands in a pit of garbage, surrounded by wild, rambunctious Martians. What is he to do next? I give this film an A++ for character development, but a C- for story. I loved the characters! (My favorite was Ki. She was so refreshingly original!) The story could have been ten times better, though, and the animation was not very good. I like to see how well animated films can portray emotions, and this did not do that very well. 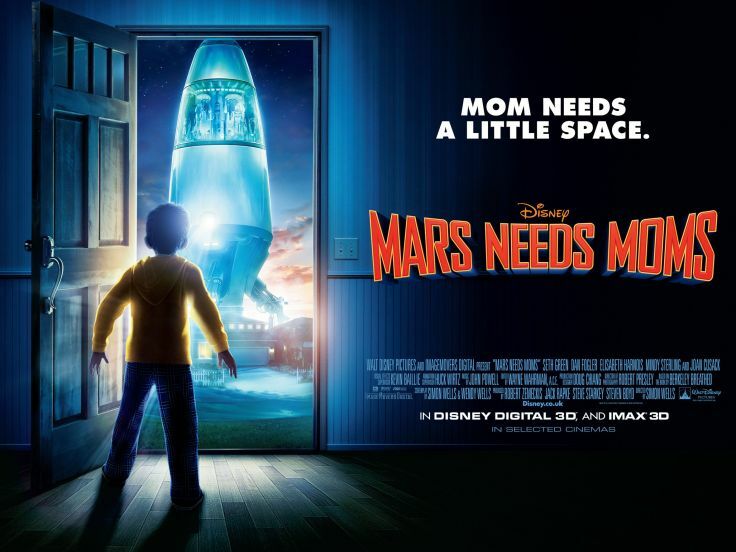 *spoilers* Just watch to see how the mother reacts to being on Mars, and you'll see how poor the animation is. Have you seen Mars Needs Moms? Who is your favorite character?